You Could Never Be Replaced… But Your Teeth Can! Dental implants are considered the gold standard for replacing teeth in the dental industry. First used in the 1960s, they are much more common today, in large part because they are made of titanium, which is a metal capable of bonding with tissue and bone during healing. Studies and clinical experience have shown dental implants to be safe, convenient, and natural-looking. When taken care of properly, a successful dental implant can secure your smile for life. Garrison Family Dentistry is a one-stop shop for dental implant treatment. From the first consultation and treatment planning with 3D CT imaging for the most precise diagnosis to actual implant placement and restoration, we’ve got you covered! Titanium is close to magical in its ability to incorporate itself with the tissues and bones of the jaw. 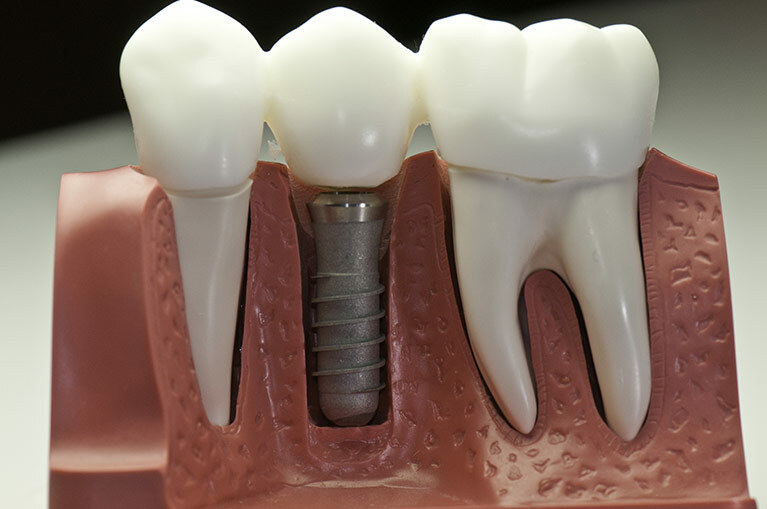 Not only does an implant replace the tooth, but its titanium construction replaces the tooth root. The unique properties of titanium are what make modern implants the exceptional dental solution for missing teeth today. Implant-supported dentures are another revolutionary dental restoration. Instead of traditional prosthetic dentures, patients with satisfactory gum health can choose permanent implant-supported dentures locked securely into place in the mouth. No adhesive is necessary—and you’ll never have to take out your teeth again! Are You Ready to Lock it Down? If you have questions about dental implants or implant-supported dentures for your Smithville implant dentists, fill out the form below to send us your contact information and we will get in touch with you to set up an appointment. Or feel free to give us a call. We can’t wait to help you!